Predicts full-year loss of $600m and average bunker price of $451. 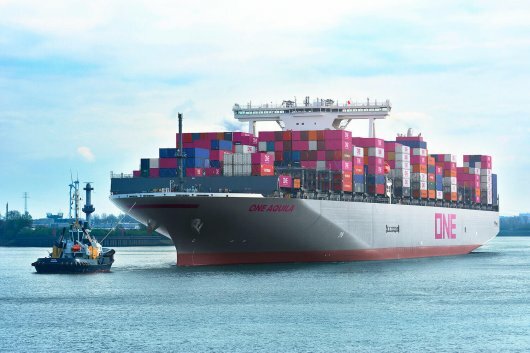 Japan's Ocean Network Express Holdings, Ltd. (ONE) - a holding company for the container shipping businesses of parent companies Kawasaki Kisen Kaisha (K Line), Mitsui O.S.K. Lines (MOL) and Nippon Yusen Kaisha (NYK Line) - has revised its forecast for the first half (H1) and full year downwards. As previously reported, ONE had expected to achieve a full-year (April 2018 to March 2019) net profit of $110m, but now predicts that it will instead post a loss after tax of $600m - $710m lower than the amount projected at the end of July. And for H1 (April to September 2018), ONE anticipates a net loss of $310m - which is $272m below the $38m loss forecast two-and-a-half months ago. In terms of bunker prices for H1 and the full year, ONE has actually revised its average figures slightly downwards for both periods. ONE's full-year forecast is now $451 per tonne, which is $3 lower than July's price prediction, but still $68, or 17.8 percent, higher than April's $383-per-tonne expected figure. ONE said the two main reasons for the downward revision were the "stagnation" of liftings and utilization, and its inability to reduce costs sufficiently to address the rise in bunker prices. Explaining the reason for the drop in liftings and utilization, ONE said it was due to "teething problems" - where staff were "short-handed" and "not completely familiarized with the newly introduced IT system" - when the new service was launched in April, and that it later "sought to regain lost ground during the peak season from July to September, but liftings and utilization remained lower than the outlook because the negative impact remained on its main Asia-North America routes and Intra-Asia routes". ONE noted that the initial "teething problems" had been resolved - with staff shortages and skill levels addressed - but that "liftings and utilization are still on the way to recovery, and the target for additional cost reduction to address increased bunker prices, is expected to be lower than the target in the previously announced forecast". As previously reported, the average bunker price paid by ONE's vessels between April and June was $407 per tonne, with the company posting a net loss after tax of $120m, which was said to be mainly due to higher-than-anticipated bunker prices and operational teething issues during the firm's start-up period.